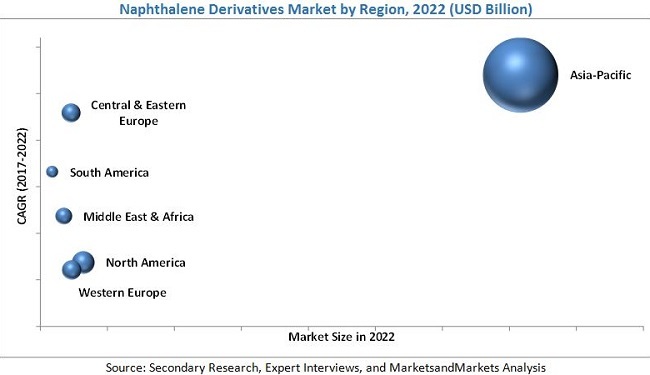 [143 Pages Report] The global naphthalene derivatives market is estimated at USD 1.48 Billion in 2016 and is projected to reach USD 1.85 Billion by 2022, at a CAGR of 3.8% between 2017 and 2022. In this study, 2016 has been considered the base year and 2022 as the forecast year to estimate the naphthalene derivatives market size. Different secondary sources, such as company websites, encyclopedia, directories, and databases such as Hoovers, Bloomberg, Businessweek, Factiva, and OneSource have been used to identify and collect information useful for this extensive, commercial study of the global naphthalene derivatives market. Primary sources, including experts from related industries, have been interviewed to verify and collect critical information and assess prospects of the market. The top-down approach has been implemented to validate the market size in terms of value. With data triangulation procedures and validation of data through primaries, the exact values of the overall parent market size and individual market sizes have been determined and confirmed in this study. The naphthalene derivatives market has a diversified and established ecosystem of upstream players, such as raw material suppliers, and downstream stakeholders, such as manufacturers, vendors, end users, and government organizations. This study answers several questions for stakeholders, primarily, which market segments they should focus upon during the next two to five years to prioritize their efforts and investments. These stakeholders include naphthalene derivatives manufacturers such as Koppers (US), BASF (Germany), Rütgers (Belgium), Evonik (Germany), Cromogenia Units (Spain), King Industries, Inc. (US), Carbon Tech Group (Iran), JFE Chemical Corporation (Japan), Clariant (Switzerland), and Huntsman Corporation (US). This research report categorizes the global naphthalene derivatives market based on form, derivative, end-use industry, and region, and forecasts revenue growth and provides an analysis of trends in each of the submarkets. Each derivative is further described in detail in the report with value and volume forecasts until 2022. Each region is further segmented by key countries, such as China, India, Japan, South Korea, Indonesia, the US, Mexico, Canada, Germany, the UK, Italy, France, Spain, Turkey, Russia, Poland, Saudi Arabia, the UAE, Argentina, and Brazil. The global naphthalene derivatives market is estimated at USD 1.53 Billion in 2017 and is projected to reach USD 1.85 Billion by 2022, at a CAGR of 3.8% between 2017 and 2022. The market is witnessing growth due to the growing demand from the textile industry especially in emerging countries of APAC and increasing consumption of construction chemicals such as naphthalene-based superplasticizers in developing countries. Based on form, powder was the largest segment in 2016. Ease of logistics of powder form of naphthalene derivatives and convenient transportation and packaging in comparison to liquid form are responsible for the growth of this segment of the naphthalene derivatives market. Based on derivative, Sulfonated Naphthalene Formaldehyde (SNF) was the largest segment of the global naphthalene derivatives market, in 2016. The large market size of SNF segment is due to its use as a superplasticizer in concrete admixtures in the construction sector. SNF are cost-effective in comparison to other superplasticizers such as sulfonated melamine formaldehyde condensates and modified lignosulfonates and give high strength and durability to concrete. Based on end-use industry, construction was the largest segment of the naphthalene derivatives market in 2016. Increasing use of naphthalene derivatives such as SNF and phthalic anhydride which are used as superplasticizers in concrete and manufacture of PVC plastics in infrastructural development is driving the demand from the construction industry. Furthermore, the increase in repair and maintenance activities, growing construction of residential complexes to accommodate the mounting population, and increase in service sector economy are also expected to contribute in making construction the largest end-use industry in the naphthalene derivatives market. Asia Pacific was the largest market for naphthalene derivatives in 2016. The region’s flourishing manufacturing sector, ample availability of labor, competitive cost base, and increasing consumer demand are expected to drive the market for naphthalene derivatives across the region. Furthermore, the influence of macroeconomic stimuli such as population growth, rise in disposable income, and increasing investments in building & construction activities in Southeast Asian countries are also expected to make the region one of the most promising markets for naphthalene derivatives. 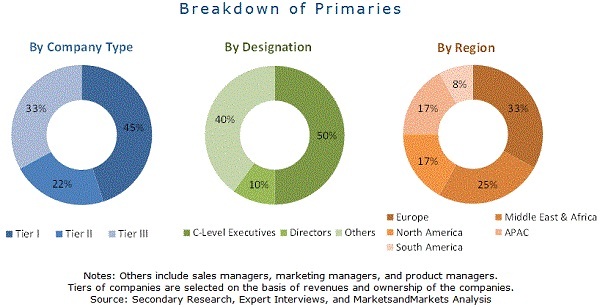 The global naphthalene derivatives market is witnessing moderate growth. Factors restraining and challenging the growth of the naphthalene derivatives market are the toxicity associated with naphthalene derivatives, preference for alternate feedstock for phthalic anhydride, fluctuating energy prices, and overcapacity issues in China. Koppers (US), BASF (Germany), Rütgers (Belgium), Evonik (Germany), and Cromogenia Units (Spain) lead the global naphthalene derivatives market. These players are gaining a strong foothold in the market through their strategies of agreement & joint ventures to regenerate the trailing growth. 12.11.3 GEO Specialty Chemicals, Inc.
12.11.7 Iwaki Seiyaku Co., Ltd.